Following our short summer hiatus, cult comedy competition, Pundemonium LIVE! is back to settle some scores. A hilarious game show full of PUNishing linguistic challenges by Rachel Mars and Daniel Pitt, for compulsive punners and their carers. Guest pundits including performers, comedians, poets and writers to compete alongside members of the public for the ‘Thesaurus Rex’ trophy and a place in December’s Second Annual Grand Final. 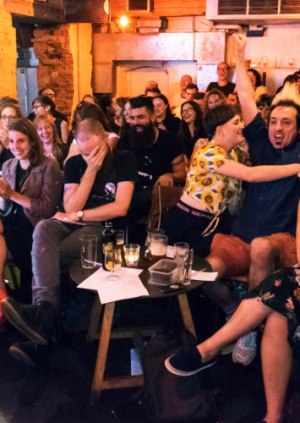 High profile previous contestants have included comedians Pippa Evans and Robin Ince, Timandra Harkness and poet Harry Baker competing equally alongside members of the public - and the audience sign-ups often do best! Advance booking highly recommended – we regularly sell out! Be PUNctual for an 8pm start!